The Model 365A, E365A vibration switch is an acceleration sensitive instrument for hazardous environments that measures the total acceleratory shock present on the machine and will be triggered when the total acceleration exceeds its designated threshold. 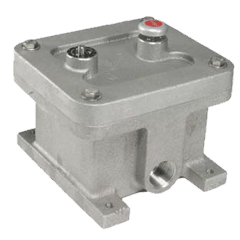 The Model 365A, E365A vibration switch provides protection for large motors, pumps, compressors, and other rotating equipment by alerting the user to excess vibration. Failing bearings, bent shafts, broken blades, over-speeding and similar malfunctions cause increased imbalance or high frequency vibration detectable with the model 365A vibration switch. The instrument may be wired to actuate an alarm or cause a shutdown before costly damage occurs. The switch is designed for maintenance-free service in permanent installations. Acceleratory measurements made by the vibration switch are the summation of all the individual accelerations giving a total destructive force acting on the machine - the result is positive worry free protection. With the growing use of computers, an increasing number of applications are coming into existence where a vibration switch will be connected to a computer or PLC. In these applications the voltage and/or current may be too low for standard contacts. For these applications the Model 365A and E365A may be supplied with an optional sealed switch with gold contacts. _ - No special options. Enclosure 4 & IP66, unpainted aluminum. E - Enclosure 4X & IP66, exterior painted with gray epoxy enamel. H - Space heater installed for maintaining internal area of unit moisture free. Space heater voltage same as reset coil voltage. EH -Enclosure 4X & IP66, exterior painted with gray epoxy enamel, and space heater installed for maintaining internal area of enclosure moisture free.